Motorola Is All Set To Announce Big Updates On 28th July. So everyone has finished or they're getting started with their part of "Flagship Smartphone" for the year 2015. So far it's been Htc One M9, Samsung Galaxy S6/S6 edge (Note 5 in works), LG G4, Sony Xperia Z4(yet to be released), Oneplus 2( On the way) Iphone 6/6plus (6S on the way), But what about Motorola? A company that is well known for almost close to stock Android experience, A company that was under Google few years back ? Well there have been bevy of leaks & speculations regarding Moto G(2015), Moto X(2015). Well I'm a type guy who does not believe in speculations, unless it's revealed from a trusted source. 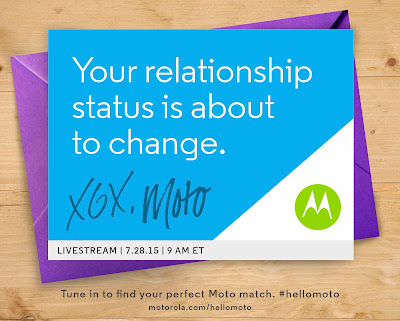 Keeping that aside, Motorola just posted an article on their blog sending out press invitations. They've posted, " Your Relationship status is about to change. X6X, Moto ". The launch keynote is going to be on 28th of July and it's going to be live-streamed maybe via Youtube(I'll keep to posted reg any updates on twitter). Well leaving that unpleasant quote of relationship status or whatever, Those 2 Codes in particular reveal few things. X6X clearly depicts a newer version of Moto 360, While Moto means those leaked renders that hopefully translates to newer Moto X, Moto G & Moto E 2015 Smartphones. So mark your calenders folks and set a reminder, if you're excited signup here to know more about the new Moto.